While I’ve been sharing a little here and there about new skin care products I’ve been working into my routine, I realized it’s been a while since I shared exactly what my routine is currently. Yep, it pretty much took about a year to really get a good routine down for this climate. After moving to Vegas, my skincare routine needed a complete overhaul. Literally for the first time in months, I feel like I really have a good thing going, and wanted to share what my skin care routine for combo acne prone skin is right now! Have a different skin type? Check out this post to create your own skin care routine. I’ve specifically been using this routine during spring and summer, and I finally feel like I have a handle on my skin for the first time in a while. My breakouts are pretty isolated to my time of month, my combo skin feels more balanced, and my hyper-pigmentation is fading faster. I’m sure my routine will switch up for upcoming fall and winter, so let me know if you want an update once I swap out my products! These are hands down my new favorite makeup remover wipes at the drugstore. Not only are they super budget-friendly, but they work, period. 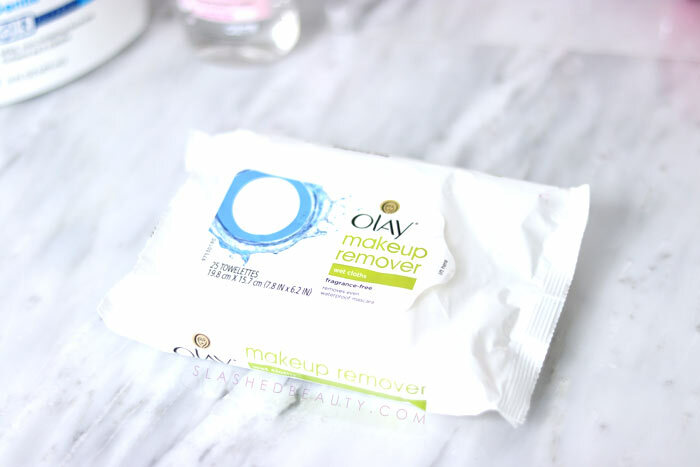 Even on caked-on full face makeup is no match for these wipes. It slides makeup off the face easily without having to rub or tug at my skin. 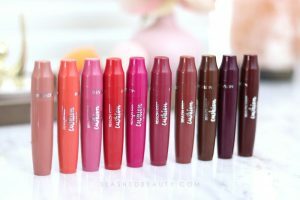 They impress me the most when met with thick, dry mascara. It removes it quickly without any lost lashes! 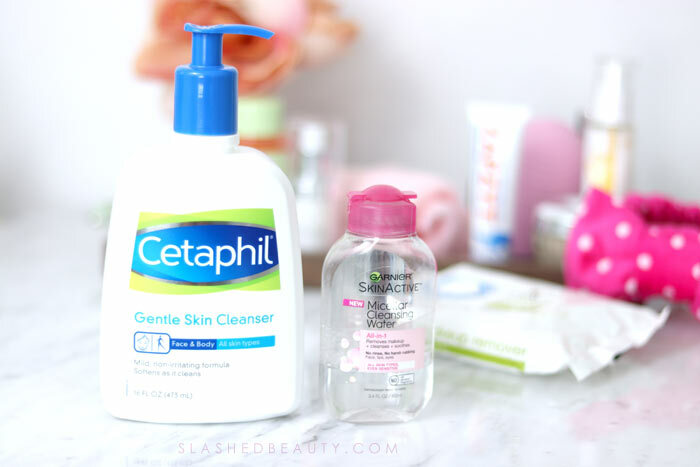 The Cetaphil Gentle Daily Cleanser is one of my all time faves. Even when I test out new cleansers to review, I always end up coming back to this one because I can trust it to just work with my skin. It gets off any dirt and makeup residue without stripping my skin, and actually leaves my skin feeling soft. My combo skin also feels more balanced when I use this cleanser; the oily patches and dry patches aren’t so polar. On days when I’m not wearing makeup, or after the gym, I like cleansing with Garnier micellar water because it’s super mild. It’s great for a quick cleanse since you don’t need to rinse it off. I also like using micellar water in the morning instead of doing a deep cleanse if I don’t feel particularly oily. 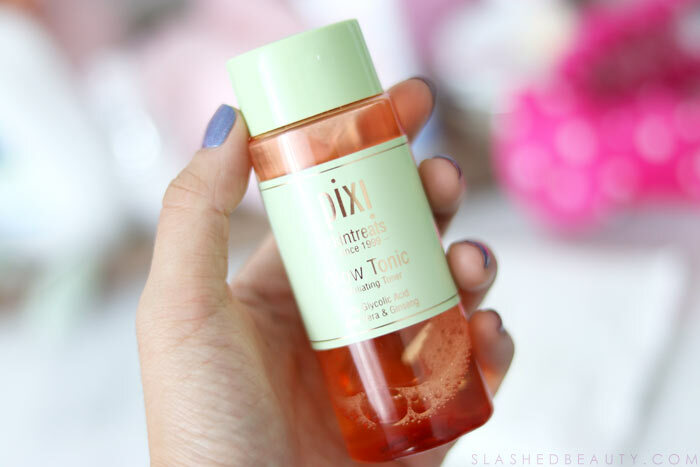 My skin isn’t the same when I stop using the Pixi Glow Tonic. If I run out and I take a break from it, I can actually see and feel a difference. This toner is 5% glycolic acid and gently exfoliates to even out skin tone and keep acne at bay. My hyper-pigmentation fades so much faster when I use this. My skin looks brighter and the texture is smoother. 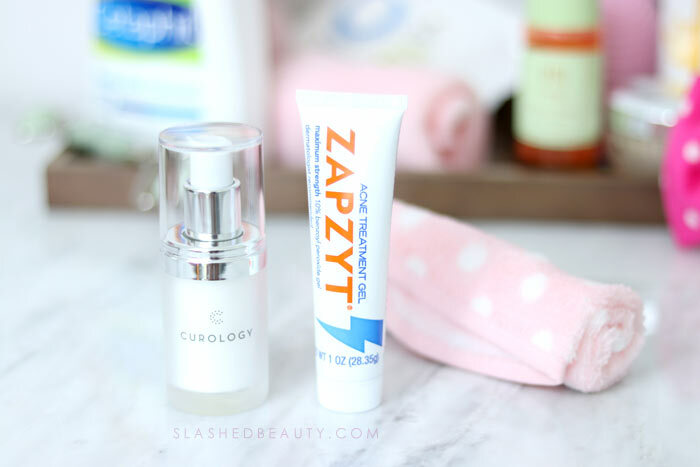 I’ve been using Curology for the past four years now, and it has completely changed my skin. My acne is now manageable thanks to the custom treatment they provide. You can learn more about Curology here, but it’s basically a monthly subscription where you have access to an online dermatologist who will prescribe you a custom all-over-face treatment to get your acne under control. It’s affordable, all done from home, and gives you a chance to try prescription-strength treatment on a budget. For stubborn zits that are taking too long to go down, I use the Zapzyt Acne Treatment Gel which is a maximum strength 10% Benzoyl Peroxide spot treatment. It shrinks pimples considerably overnight and also reduces redness. I do NOT mix Zapzyt and Curology since the ingredients don’t play well together. 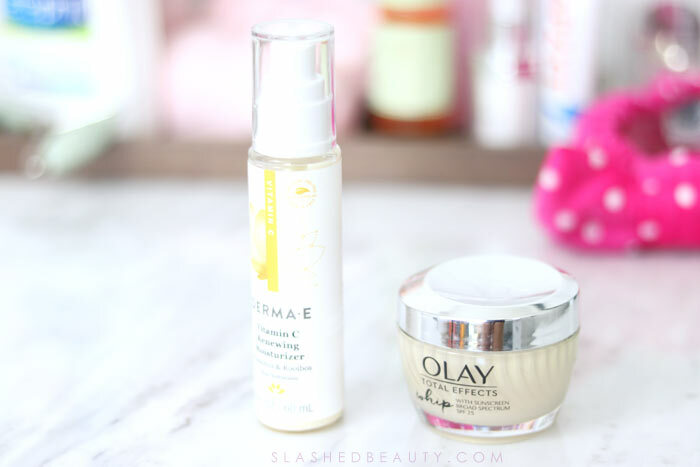 For day time, I always use something with SPF and that can be layered easily under makeup. I was a big fan of the original Olay Whips moisturizer, and I was so hyped when they added SPF to the formula. It’s not as thick as your typical face sunscreen— it sinks in quickly and hydrates instantly. Plus, the Total Effects line has extra skin benefits, seven in one jar! At night, I’ve been using the Derma E Vitamin C moisturizer. Vitamin C is a great ingredient for acne-prone skin, and it also helps with brightening and evening skin tone. This moisturizer combined with my toner has helped fade dark spots quickly. It’s incredibly moisturizing but lightweight, which I need at night because I hate feeling product on my face when I go to sleep. 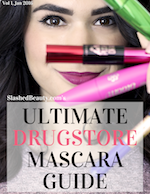 My eyes are incredibly sensitive— there are so many products that make them burn or dry out. 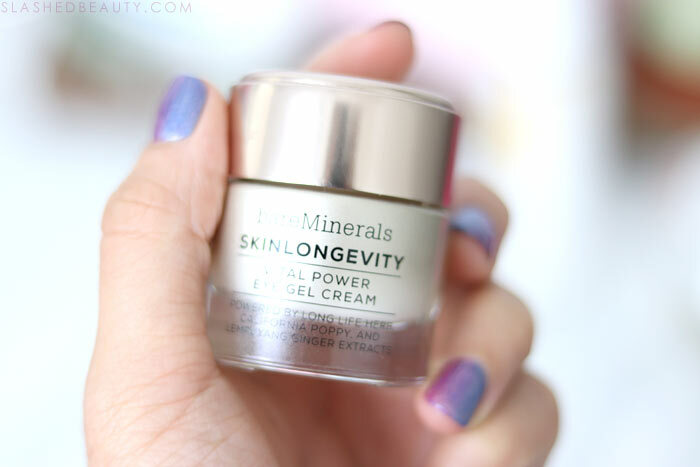 This has been one of my favorite eye creams that I’ve tried in a long time that is relatively affordable (I had been using a really expensive one for a while). It’s a cream, but has a gel consistency so it sinks in quickly and is super light. What I like the most about this product is that when I wake up in the morning, my eye area still feels hydrated! Other eye treatments usually “wear off” by the time I wake up, but this one feels like it’s still doing its job. I haven’t experienced any irritation at all and this actually helped heal my eye area when I was going through a particularly flaky period after traveling. I’ve spoken about both of these tools very recently here on the blog. 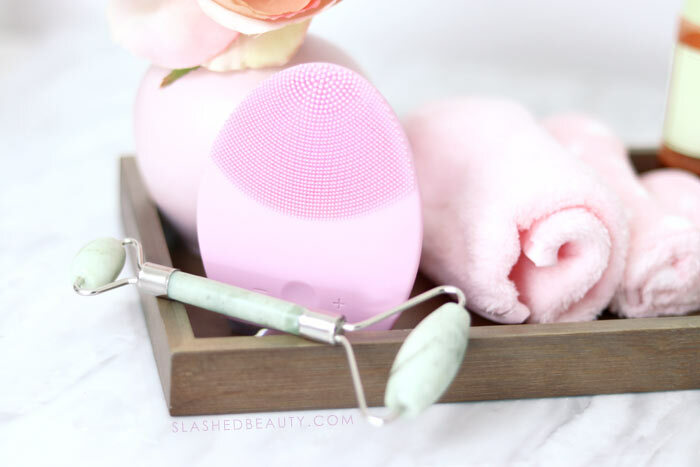 The FOREO LUNA device is for cleansing, and helps gently exfoliate while removing makeup, dirt and oil. You can learn more about it in my review here. The Jade Face Roller is for lymphatic massages, to help drain built up fluid and toxins from my face. This reduces puffiness and helps achieve an even glow. Read more about my face rolling routine here. 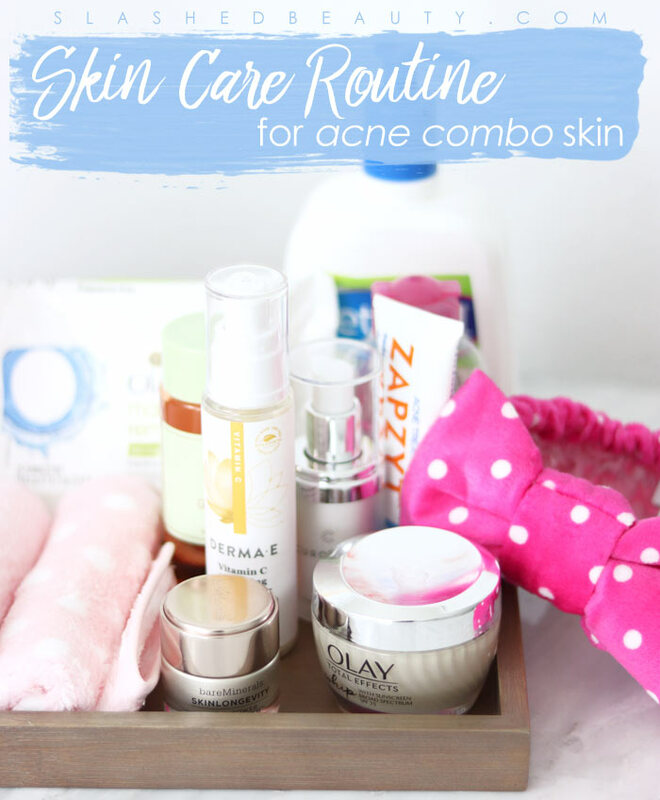 I’m going to stick to this skin care routine for my acne prone combo skin until the weather changes again, or until my skin tells me I need something else! What do you use in your skin care routine for acne or combo skin?